The Car GuideNews2012 Nissan Versa: The sedan comes first! 2012 Nissan Versa: The sedan comes first! 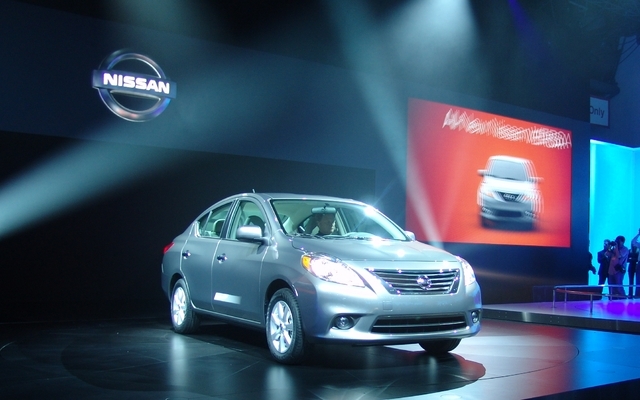 The Nissan Versa was first unveiled in China, at the Shanghai Auto Show. But just a few hours later, it surfaced in New York. On both sides of the planet, Nissan unveiled the sedan version of its popular sub-compact, which could practically pass for a compact given its spacious interior. This was the case in the last generation, and it’s still true, if not more so, despite the fact that the total length of the vehicle has come down somewhat. A longer wheelbase is to thank for the added millimetres enjoyed by rear passengers and in the trunk. Even at a glance I could tell that the trunk is very big, as is the glove compartment. Interior space is one thing, aesthetics are another. As Carlos Tavares mentioned at the Versa launch, this newcomer has a much more sophisticated appearance. You have to admit it’s true. The Versa is reasonably good-looking, but less so than the new generation Hyundai Accent, which was introduced at the Montreal Auto Show last January. But the Versa’s looks outshine the Toyota Yaris. Essentially, it boils down to personal taste. With the new Tiida (that’s the Versa’s name on Asian markets), Nissan spared no expense. The “V” chassis is new and the mechanics are borrowed from the Juke turbo: a 1.6-litre engine producing 109 horsepower and 107 lbs-ft of torque. Two transmissions are offered, a five-speed manual or a new, smaller and lighter CVT. Nissan has posted fuel consumption at 7.8 L/100 km in the city and 6.4 L on the highway. If you pay close attention, you’ll notice the Pure Drive label here and there on the Versa’s body. This is not a reference to hybrid technology or heat recovery; rather it is used to point out which models feature the latest generation of engines and transmissions. The Versa will be sold in 170 countries. Units distributed in North America will be built in Mexico. For the time being, only the sedan will come to Canada, with the hatchback following later (my little finger told me it should arrive within a few months). In the meantime, both generations of the Versa will grace showrooms. The sedan will go on sale toward the end of summer 2011. So, what are the chances that the Versa sedan will infringe on the Sentra’s territory (given that this car is also due for a refresh)? Chances are pretty good, but since this is already happening, we shouldn’t notice too much difference (these are certainly not Nissan’s words…). The current Versa is a very good car. The next may be even better. Let’s hope so!